Anandamela 5th December 2016 Bangla magazine ebook pdf file. 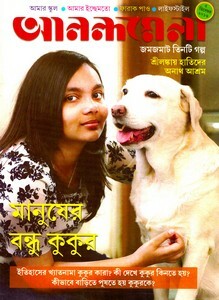 The most famous Bangla fortnightly children magazine- Anandamela which is publish from Kolkata by ABP Limited. The fortnightly edition usually publish on 5th and 20th date of every month. Today I want to share with all of my dear and sweet little friends, Anandamela's 5th December 2016 edition. The cover stories of this edition's are Three excellent stories, Orphanage of elephent in Sri Lanka, Dog is best friend of our, sports news etc. From here, also get all old edition of Anandamela.